Arsenal head coach Unai Emery believes Mesut Ozil's decision to retire from international football will help him adapt more quickly to his methods. The playmaker retired from international football in July citing what he felt was discrimination against his Turkish heritage from the German Football Association as a motivating factor, claims which were emphatically rejected by the governing body. 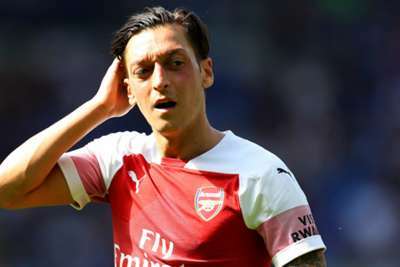 Ozil's outburst came after he felt he had been unfairly targeted for criticism following his meeting in May with controversial Turkish president Recep Tayyip Erdogan. At the time, Ozil said he would not be available for Germany "whilst I have this feeling of racism and disrespect", and was not called up for Die Mannschaft's recent double-header against Netherlands and France. Emery believes Arsenal will stand to benefit from Ozil's prolonged period on the Gunners' training pitch, starting with the Premier League clash against Leicester City on Monday. "I can't explain [my methods] to the players who are playing with the national teams," he told a media conference. "It is not easy because they are playing two matches. When the players stop for these games maybe they can lose focus for us with training and improving on things. It could help him [Ozil] find our ideas more quickly." Arsenal will be aiming for a 10th consecutive win in all competitions when the Foxes visit Emirates Stadium and Emery has warned his side against complacency in their bid to keep pace with the league's pacesetters. "We are doing it our way and we are improving," he said. "We need to carry on to find our best individual and collective performance to stay close to Manchester City and Chelsea. "But we need to get better at a lot of things now. We need to stay with the best teams. We need to get better at different things. We need to continue working calmly."